This week's What to Wear Wednesday focuses on My Fair Lady. So following the pointers outlined in the first What To Wear Wednesday Post… let's dive in. Keep in mind, I don't actually suggest going out and buying a whole new wardrobe for every audition. A lot of these looks can work for multiple shows. AND, I bet you can find looks that are similar to these in your on closet. This is just to get you thinking about “WEARING LIKE YOU CARE” at your auditions. We'll focus on 2 main characters, Eliza Doolittle and Freddy Eynsford-Hill. I started with a google image search to get an overview of the characters. I kept getting pictures of Audrey Hepburn so I made my search terms a little more specific. I searched for “My Fair Lady on stage Eliza Doolittle” Here's what I found. My fair Lady is set in the early 1900's so let's also do a google image search for women's clothing in the early 1900's. The skirts are long and fitted at the waist. Blazer type jackets with that button up the front. Boots that come to the ankle. Eliza's character varies between poor and upper class. 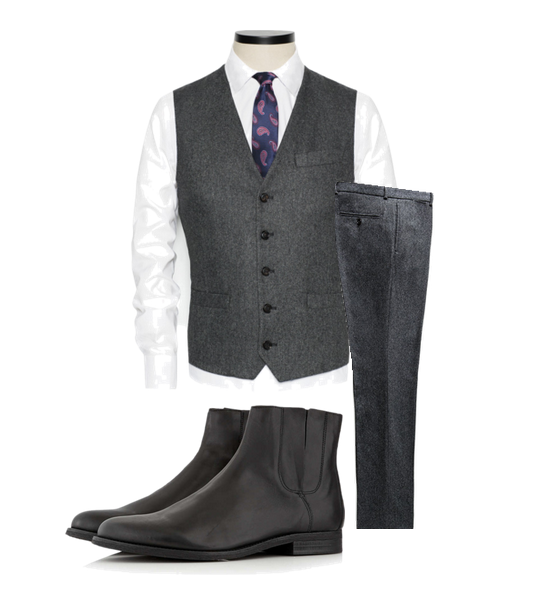 I spent some time searching the web and put together the following look. What do you think!? I've included links to each individual piece below the image. To keep things consistent… I did a google image search for “My Fair Lady on stage Freddy.” Here's what I found. I also did a google image search for “Early 1900's Men's Fashions. Here's what I found. I wanted to see more photos of the shoes of the time, so I searched for “Early 1900s Men's Shoes” as well. Boots that come to the ankle (Be careful not to totally trust these google image searches! There are clearly some women's shoes in this last picture). Ties, some bow ties… but mostly longer ties. Taking all of this into consideration… here's what I came up with. I love researching these audition looks! If you have an audition coming up and you are wondering what to wear… let me know in the comments below. I'll add your show to my list. Also – if this post has you wanting to audition for My Fair Lady. There is a My Fair Lady audition coming up in Southern California at the Candlelight Pavilion. Here's the info – My Fair Lady Audition – Dec 30th. PS – Some of the links listed here are part of the Amazon Affiliate program. We will get a small commission if you purchase these items with no extra cost to you : ) BUT!!! I promise that we are only recommending items that we love. I like it! And I think both of these outfits could be used to audition for Mary Poppins as well. That women’s suit would work okay for Mary Poppins and for The Music Man, right? Same time period. Although one is England and the other Bible Belt America. Mary Poppins is actually the first thing I think of every time I look at that jacket. : ) It would totally work for Music Man too! This women’s outfit could also work for Ragtime, as it is in the same time period as these shows.